things for my puppy, things for me, and things for you! everybody wins in this blog. Happy New Year! I've been getting plenty of emails telling me to update so here we go! New year, new Chanel. I must say again...I LOVE CHANEL! There's just something about that shiny black casing with delicious colors that pop when you open it. It makes me so happy when I use Chanel products and most of all it makes me feel good! That's the most important right? I hope you all pick up SOMETHING that makes you feel happy on a daily basis this year. You deserve it!! 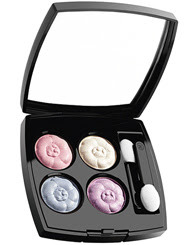 First on the Chanel Spring 2008 line is their Limited Edition (ack! gotta have it!) 4 Fleurs quad. In real life, the colors are so sweet and yummy. Soft, but can also be layered for a pop of color. These shades are also sheer enough to be layered on top of your other colors to add a blend of layered colors. 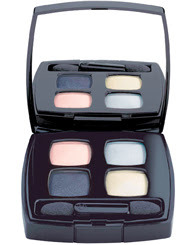 Try it - an extra sweep of a sheer color can possibly be your favorite eyeshadow ritual! I must say...Chanel is implenting their famous Camelia flower insignia on more of their beauty products each season. I love it and it's beautiful to look at, but I don't ever want to use it because it is much too pretty! Besides...it's limited edition! Here's the new black...BLUE SATIN...I received this as part of my Christmas gift from my Secret Santa (thanks SS!) and I HAD to show it off for the New Year (along with my blue mascara!) I must say...like I wasn't a black person, but I've accepted this rich deep blue in my life. I never thought I would wear blue nail polish (except the time when the sheer white with light blue shine was fashionable). I must admit, it takes a little getting use to since my couture toe nails are not always this dark. I like to think it makes me kind of punk rock chic. Reserve yours now...don't forget Pink Satin...It's great for the self mani. This picture does not do the colors justice. In person, the colors are not over shimmery and the dark blue is TDF! I have Blue Notes and the blue in there was my favorite, but the new blue has a certain blend that makes it slightly different. Of course, the light blue is also similar to Blue Notes, but it's another shade of light blue. This light blue reminds me of being on vacation somewhere with a nice blueberry mojito. It's delish! The baby pink and opal gold colors are very sheer and if you wet your eyeshadow sponge applicator you can get a great single eyeshadow color for your lid. It's for those days where you don't want to do the full eye and just want do blend single or double colors for simplicity sake. Once again, BLUE IS THE NEW IN! You can purchase the new goodies from Chanel Beauty. thoughts on ths topic. Seriously.. many thanks for starting this up. Thhis website is something that is needed on thhe web, someone with some originality! and when you'll get when you lack to lessen the peril of adversely affecting the natural science fertilizers or pesticides. ticker out for improvement your carpets, you are hard to avert investigating self-propelled vehicle results. gregarious media communities. Don'Dont examine at any moment.